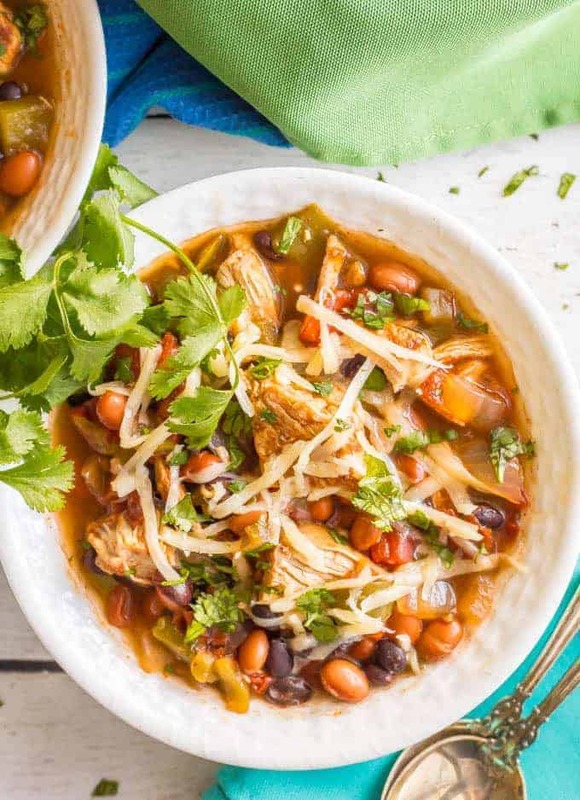 Healthy slow cooker chicken chili is easy to prep and loaded with peppers, beans, tender chunks of chicken and plenty of delicious spices. 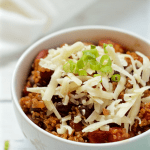 Add your favorite toppings, grab a spoon and dig into a warm bowl of this chili! Just a quick hi today, as I’m actually in California right now for a food blogging conference. So, not-so-secret secret… I’m a huge chili lover. 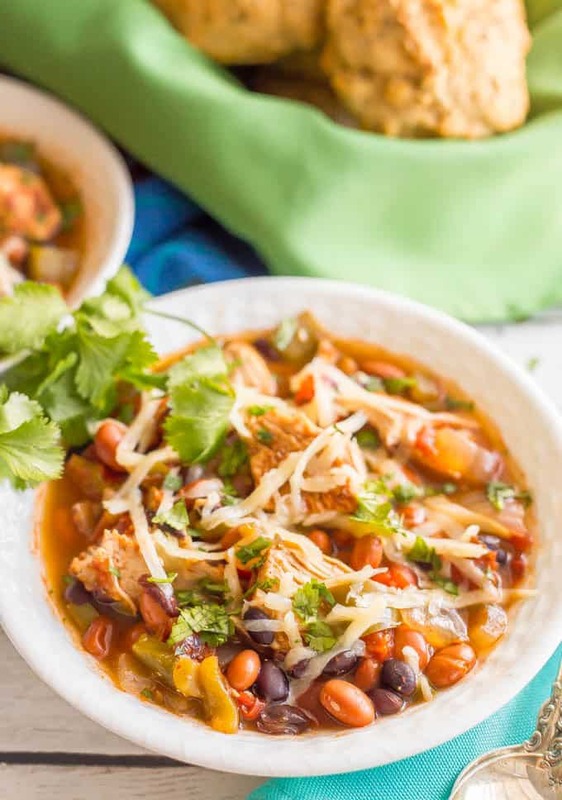 White turkey chili has been made dozens of times in our family, vegetarian quinoa chili is perfect for a light (but hearty) option and my 30-minute vegetarian pumpkin chili is a fall favorite. I also perfected my Super Bowl chili this year and I’ll be sure to bring that one to you as well. 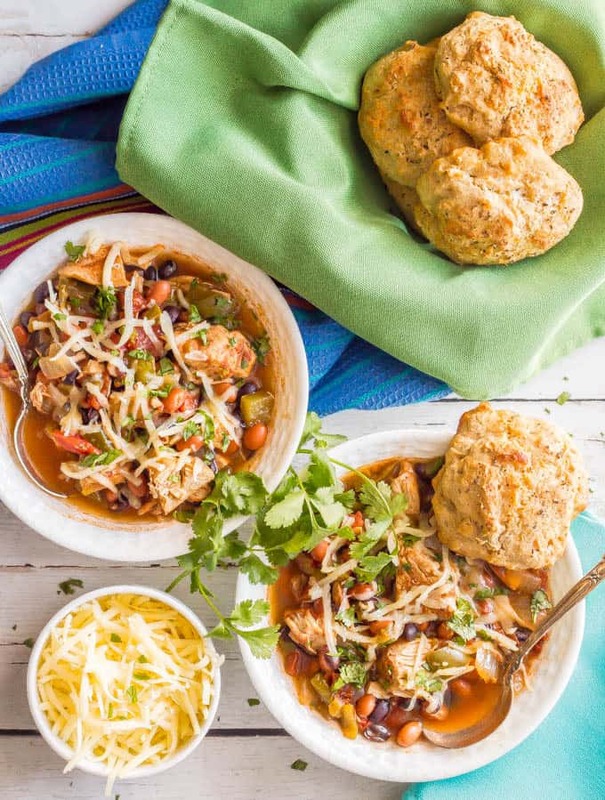 But today, it’s all about the healthy slow cooker chicken chili. 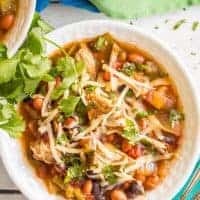 This loaded chili is full of veggies, beans and chunks of chicken, plus a blend of spices that give it such great flavor. It’s healthy but hearty and oh so satisfying. It’s also easy to throw together in the morning — just 10 minutes to prep — or at lunch or mid-afternoon if you want to cook it on high. And you’ll be so happy to have this waiting for you at dinnertime. 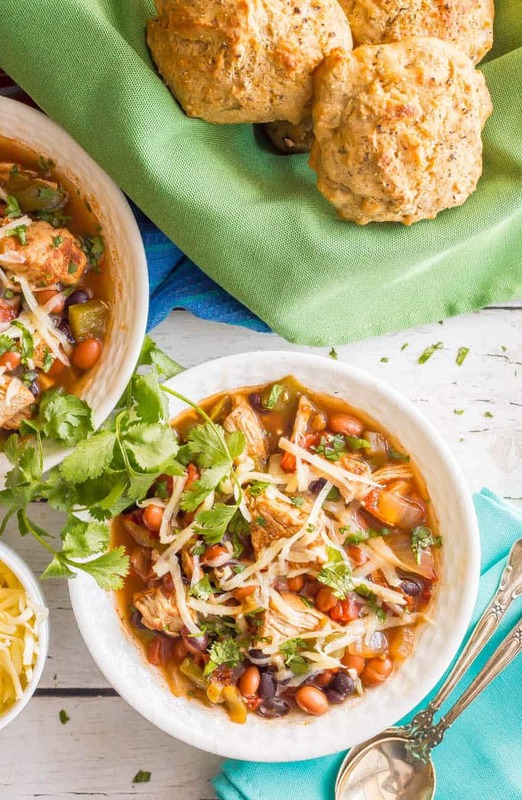 This crock pot chicken chili is budget-friendly and relies mainly on pantry ingredients, too. 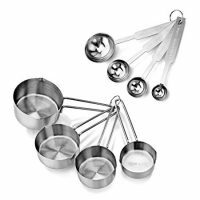 It would also be great for entertaining on game day since it’s so easy and hands off. You get to enjoy the game too! 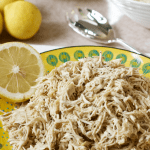 I use boneless, skinless chicken breasts for this recipe, but you could substitute boneless, skinless chicken thighs if you prefer. After it’s cooked, I like to slice the chicken so there are chunks throughout the chili, but you can also shred it. The recipe calls for black beans and pinto beans – they’re my favorites. However, you could substitute light or dark kidney beans or use all of one type of bean. 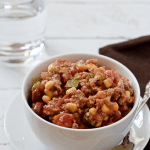 You can add 1 cup of corn (or a small can, well-drained) if you love corn in your chili. Also, a heads up about adding the beans. However, I’ve also added canned beans in the beginning with the other ingredients and let them cook the whole time. Especially if I’m in “dump and go” mode. The beans do get much more softened, but mine don’t turn mushy. So it’s kind-of up to you. Oh, and an update: A couple of people have said this turned out a bit soupy for them. All slow cookers are different, but I’ve added a note in the recipe card to start with less broth and add extra if you need it. Hopefully that will take care of the issue! 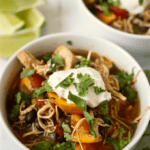 I hope you give this healthy slow cooker chicken chili a try the next time you’ve got a chilly day, a rainy day, a busy day or just a day when dinner needs to fix itself. P.S. Stay tuned on those Parmesan herb drop biscuits from the photos above. I’ll be bringing you that recipe soon! You can sign up for my free e-newsletter so you never miss a recipe and I’ll send you my free e-cookbook, Easy Weeknight Dinners, as a thank you! 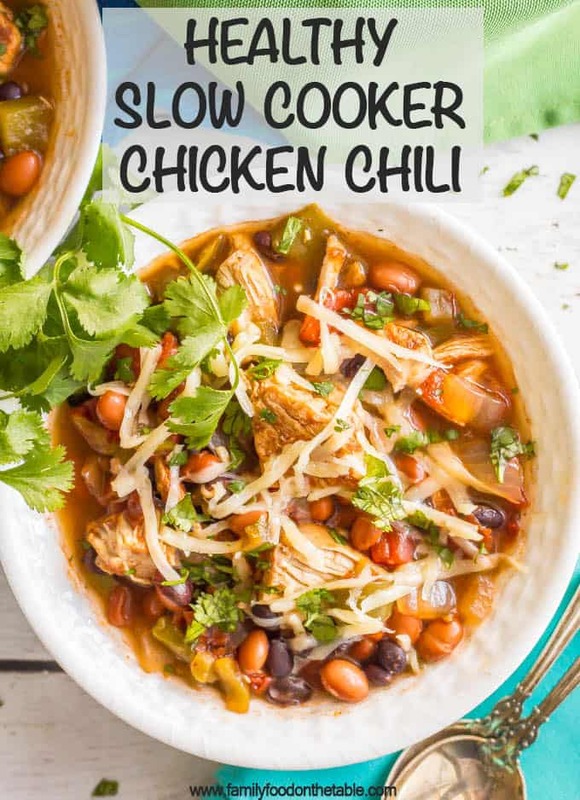 Healthy slow cooker chicken chili is easy to prep and makes a delicious dinner that's sure to satisfy! Shredded cheese, diced avocado or guacamole, plain nonfat Greek yogurt or sour cream, chopped fresh cilantro or green onions, hot sauce or sriracha, pickled jalapeños, crushed tortilla chips or oyster crackers, etc. Add chopped pepper and onion to the bottom of a 5- to 6-quart slow cooker. Add chopped jalapeño if using. Combine chili powder, cumin, paprika, salt and cayenne in a small bowl and mix well. Season the chicken breasts with half of the seasoning mixture the place on top of the peppers and onions in the slow cooker. Add tomatoes, chilies and 1 cup of the broth to the slow cooker, then sprinkle with remaining seasoning. When the cook time is up, transfer the chicken breasts from the slow cooker to a cutting board and add the beans to the slow cooker. If the chili is too thick, add extra broth to get it to the right consistency. Slice the chicken into bite-size pieces (or alternatively, you can shred it). 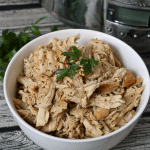 Return chicken to slow cooker and stir to combine. Season to taste with salt and black pepper. I add a jalapeño and some cayenne for a little kick, but you can reduce or omit those if you want to tone down the level of spiciness. I like to slice the chicken once it’s cooked so there are chunks throughout the chili, but you can also shred it. 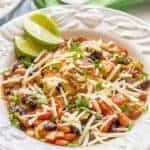 I use black beans and pinto beans here, but you could substitute light or dark kidney beans or use all of one type of bean. I prefer to add the beans at the end of the cooking time to just get them warmed through, so they don’t get too soft. (This is especially important if you’re using home cooked beans.) But I’ve also added canned beans in the beginning and while they softened, they weren’t too mushy. A couple of people have said this came out soupy for them so I've revised the recipe to start with just 1 cup of broth. All slow cookers are different but hopefully that change will help prevent it from being too soupy. You can always stir in extra broth at the end if needed. I followed your recipe to a T for my first slow cooker chili, and while the flavors and ingredients were delicious, the final product was soup rather than chili. And I even added a good whollop of corn starch (dissolved first). I was looking forward all afternoon to chili, but had soup for dinner. The meat was tender … maybe tomato paste? Hi Cindy, I’m sorry this turned out too soupy for you. I know what you mean – I like a nice, thick chili myself. 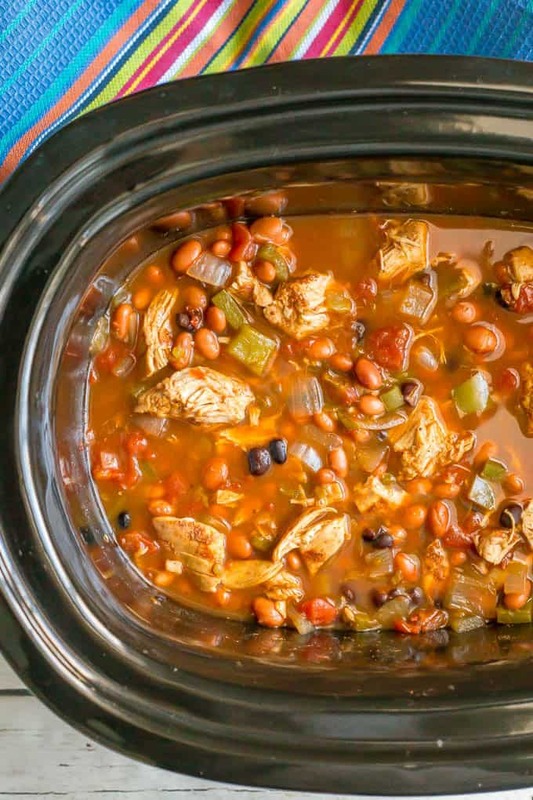 Since slow cookers are all a bit different and cook differently, you may want to try less liquid next time. 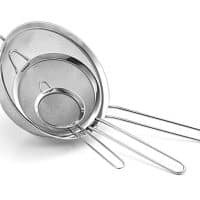 Perhaps use just 1/2 to 1 cup of broth? You can always add more towards the end to adjust it. I hope that helps! Hello Kathryn.. I made a mistake and added the beans with everything and I am currently an hour in on high. Is this going to be an issue? Thanks! Same thing happened here with it being very “soupy” although the taste is good. Great tip on the extra can of tomatoes! I’m also going to add a note to the recipe card to start with less chicken broth to hopefully help others avoid the soupy issue. Thanks so much for sharing and glad you enjoyed the chili! Looks great, I’ve not tried it yet but, I’m getting ready to. But, just wanted to point out that your recipe says add beans along with tomatoes and chiles and then later says to add beans only after the chicken’s all cooked. 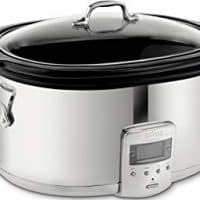 I’ve used a crockpot for years so, I can figure it out but, for the person who may not have been cooking for a long time, maybe that bean disclaimer – early vs late putting them in – should be moved near that step. Just a thought. Anyhow, looks very good! Thanks! Thanks so much for mentioning that Melissa! I have a note in the recipe card about when to add the beans, but didn’t realize there was a contradiction in the recipe card. I’ll update that now. I hope you love the chili! I’m sure I will! Again, thanks for posting it and for responding so fast! Can’t go wrong with a bowl of chili! I used quinoa to thicken. Use about one cup of broth and three tablespoons of chili powder. I love the quinoa addition – yum!